Rachael sent me this look for less earlier this week. She told me it was a dead ringer, and she was right! I think the pattern and shape are sweet. What do you think? Leave your thoughts below. they're probably the same dress. 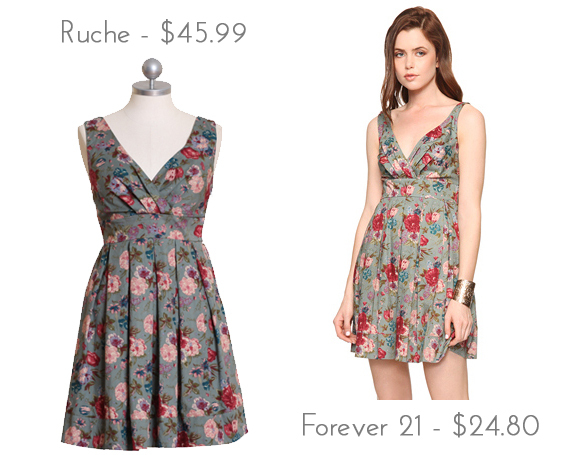 both modcloth and ruche will often carry the same dresses as f21 (although not always at the same time), but charge way more for them. wow this is identical! amazing find! nice! it does look like the same exact dress. Oh wow, AMAZING! I am totally lovin this blog!